When I was eight years old, my best friend's mother told me, over a spaghetti dinner, that my dad wasn't Jewish because he didn't believe in God. "But he's an atheist, right?" she asked. "Yeah," I said, twirling noodles around my fork. "Then he can't be a Jew," she said, rather definitively, for a Catholic. I burst into tears at the table. My father has always been very open with me about his atheism, even when I was younger and still believed in a higher power. Whenever I'd ask, "But how do you know there's not a God?" He'd say, "I don't. How do you know there's not a giant pickle behind the sun?" Still — at least in my mind — he was undeniably as much of a Jew as my mother, brother, and I. I had seen his Bar Mitzvah photos. Some of his ancestors had died in the Holocaust. He refused to let us get a Christmas tree because it made him feel (irrationally, he'd admit) uncomfortable. We celebrated Passover, Hanukkah, and the High Holidays every year, sometimes even attending temple services if any of my grandparents were in town. My dad also looks like a mix between Paul Simon and Raffi: in other words, like a mega, mega Jew. So, growing up, I never equated being Jewish with being religious — the former was a huge part of my cultural identity, while the latter was a concept I didn't quite understand. I may not cry over it anymore, but I still have a difficult time reconciling my Judaism with my feelings about organized religion. Religious moderates may ignore or overlook the more barbaric passages in their religious books, but by venerating the books in general, they leave us powerless to really oppose the belief systems of fundamentalists. And because moderates tend to ignore the most lunatic parts of scripture, they lose touch with how dangerous these books are when taken literally. In fact, they have trouble believing that anyone does still take these books literally, and so they tend not to recognize the role that faith plays in inspiring human violence. Religious moderates are blinded by their own moderation. Yet, although I wasn't even Bat Mitzvahed, I can't imagine not identifying myself as a Jew. For me, the word "Judaism" can evoke anything from steaming, fragrant bowls of my grandmother's matzo ball soup to the horrors of Auschwitz, but, most of all, it means family — and not just by blood, because every time I befriend another Jew I sense that instant connection. Jews just understand each other: our grandparents furrow their brows the same way over Scrabble boards, our mothers nag us in the same martyred tones, and our younger brothers look similarly bored and awkward when they fiddle with their Yarmulkes during services. I've never been to Israel and often don't agree with its goverment's political decisions — yet, whenever the country is in the news, I instinctually feel protective of my "homeland" before I hear the facts. I didn't realize how hypocritical I was — probably because I didn't really want to think about it — until a few years ago, when I dated a guy who hung a tiny wooden cross next to his bedroom door. I freaked out the first time I saw it, and told my friends it was a "dealbreaker," even though I know he wasn't actually a religious person in the slightest. Still, we kept seeing each other, so I finally broached the topic: it turned out the cross made him feel closer to his Catholic mother. "It's not a religious thing at all," he said. "It's about family." I still felt weird about it, until he pointed out that if it had been a mezuzah — a small piece of parchment that Jews often nail to their door frames so they can effectively inscribe the words of the Shema "on the doorposts of your house" (Deuteronomy 6:9) I wouldn't even have noticed. He was right. I'm incredibly used to — and, in fact, comforted by — even the most religious trappings of Judaism. How, then, could I ever call his cross "creepy"? It's easy to say that Judaism is different, because it's "more" than just a religion — and it is, it's an ethnicity — but I don't think it's possible to filter out the religious aspects completely, or fair for me to judge non-Jews by different standards. However, my family has devised the perfect way to celebrate Passover without making it a religious occasion. My dad rewrites the Haggadah — the Jewish text you read during a Passover Seder — and replaces all mentions of "God" with "Humanist" or, occasionally, "Spring," depending on his mood. Instead of thanking God for bringing the slaves out of Egypt, we remember our ancestors, as well as other victims of slavery around the world — my dad updates the Haggadah yearly to reflect current events. We invite non-Jewish friends, drink lots of wine, eat way too much chocolate-covered matzah, and take turns going around the room and saying what we're each thankful for. Our annual Seder has become somewhat infamous — years later, my college friends that were lucky enough to attend still reminisce about how weird/awesome my family is — but I didn't realize how sad I was that I couldn't make it back home to California this year until I over-eagerly accepted a friend's invitation to go to his cousin's Seder over an hour away from where I live. "My family is crazy," he warned me, but that only made me more excited. 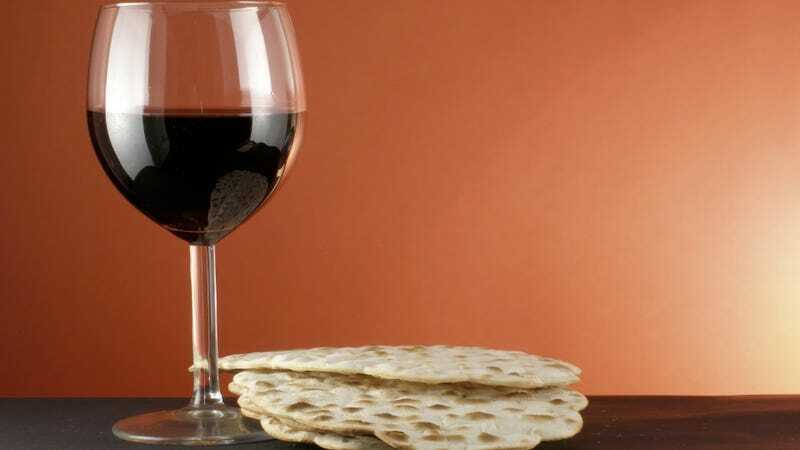 If I can't attend an Atheist seder, surrounding myself with squabbling Jews fighting over chopped liver and long-held family grudges is the next best cure for my homesickness. As Fiddler on the Roof's Tevye might say: Tradition!